Goa News |Is RSS revolt against Nagpur a storm in a tea cup? Is RSS revolt against Nagpur a storm in a tea cup? The most-debated revolt within the Rashtriya Swayamsevak Sangh appears to be a storm in a tea cup. The RSS leadership, indirectly, has allowed its Goa Swayamsevaks to work wholeheartedly to defeat the ruling Bharatiya Janata Party. “The RSS officially never takes part in active politics, but also never stops its Swayamsevaks from doing so. They are free to choose a political party and work for it”, Nana alias Laxman Behre, the newly appointed Goa RSS chief, told Goa 365 TV channel. Nana, a veteran RSS leader, is considered to be the most non-controversial personality in the Sangh Parivar, with no political allegiance to anybody. He was appointed after Subhash Velingkar was stripped off the post on 31st August in a most unprecedented manner. 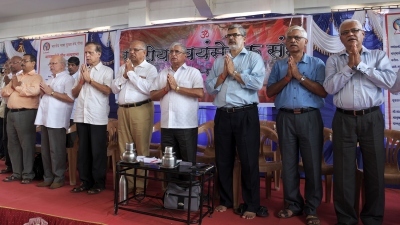 In retaliation to Velingkar’s removal, all the committee members from state to Shakha level, resigned enmass and formed a parallel RSS in Goa, calling it Goa Pradesh, detaching itself from Goa Vibhag of Konkan Prant. Within 10 days, the Nagpur-controlled RSS leadership appointed Behre as the new Goa Vibhag chief and Mahesh Dhawalikar as his Karyawah (secretary), both incidentally from the same Bori village of Ponda taluka. Rather than taking Velingkar head on by appointing a Swayamsevak close to the BJP camp, the RSS leadership has chosen a person acceptable to both the camps. “Nana is one of the most decent persons in our Sangh Parivar and I welcome his appointment”, Velingkar told the media on Sunday, after the state-level convention of the parallel RSS. He also clarified that the RSS has neither split nor will function permanently in this fashion. “We will go back to our original organisation once election is over”, said Velingkar. He termed the present so called factionalism a temporary arrangement made in an emergency situation. While yesterday’s convention unanimously resolved to stand strongly behind the Bharatiya Bhasha Suraksha Manch, Behre also reiterated that RSS will always support the BBSM stand. “But we will officially not take a political stand. Let the Swayamsevak take it in individual capacity. We have no objection”, he told section of the media when he was interviewed. In fact he also told Lokmat that strengthening the BJP is not the responsibility of the RSS. Behre also told national news agency IANS that it was a mistake of BJP national chief Amit Shah not to meet Velingkar, who showed him black flags during the former's Goa visit. Yesterday’s ‘convention of rebels’ also did not utter a single word against the RSS leadership or their action to unseat Velingkar, but hit out at the BJP leadership, especially defence minister Manohar Parrikar. Going a step ahead of relating Medium of Instruction issue to Indian culture, Velingkar alleged that the BJP has begun a denationalisation process by appeasing minorities, which even Congress did not do. The leaders came down heavily on the BJP leaders, alleging that they are trying to divide Goa’s RSS by creating confusion but not a single speaker blamed the Nagpur supremo or Konkan Prant leaders. After 12 days of the storm within the Sangh Parivar, it appears that Swayamsevaks could be divided between pro-BJP and anti-BJP stance, but not the Rashtriya Swayamsevak Sangh. Same ideology had created Pakistan then, and for almost 75 years we do not have a solution and innocent citizens are killed everyday. Lord forgive them for they do not know what they are doing.